The list of available APIs that developers have access to grows by the day, and we are now firmly in the API economy, which is a term used to describe how APIs can positively affect an organization’s profitability. Such effects on profitability are evident both for companies which allow developers to plug into their systems, and for small businesses that use API access to develop applications which enhance the functionality of existing services. With many mainstream API providers seeing up to billions of API calls per day (see this article by Nordic APIS), more and more companies are working to release APIs to improve their bottom lines. This impetus has led to some very cool new APIs being made available, the six most interesting of which to check out in 2018 you’ll learn about in this article. Whether it’s a contacts API, media management interface, or a team collaboration API, you’ll get the lowdown on use cases for some nifty interfaces outside of the mainstream ones that everyone already knows about. Chute is a visual marketing platform that allows users to search for media such as photos and videos that align with their marketing needs. Chute has released a developer API that provides access to its services, letting developers integrate the functionality of Chute with other applications. There are client libraries on Chute for Ruby, Android, AngularJS, and IOS, and the interface is RESTful. All responses are sent to and received by the API as JSON data. Chute is cool because it is, in essence, a media management tool, which enables developers to add media capture, management, metadata, and publishing to applications or websites. Count the number of likes for media assets such as photos and videos. Explore photos and videos by location filters to see what’s trending in certain areas. Programmatically import media assets from websites and social media services such as Instagram. WebDAM is a cloud-based digital asset management software used by companies to organize their digital assets, such as images, logos, and videos. The company released its own REST API for third-party applications and developers to access back in 2012. The interesting thing about the WebDam API is how it provides several opportunities and ways to enhance digital asset management. Integrate WebDam with other core business systems, such as content management systems, CRM software, and project management tools. Developers can create front-end plug-ins and extensions to harness WebDam’s power for specific purposes. Programmatically upload images and videos up to 5 gigabytes with faster upload speeds. 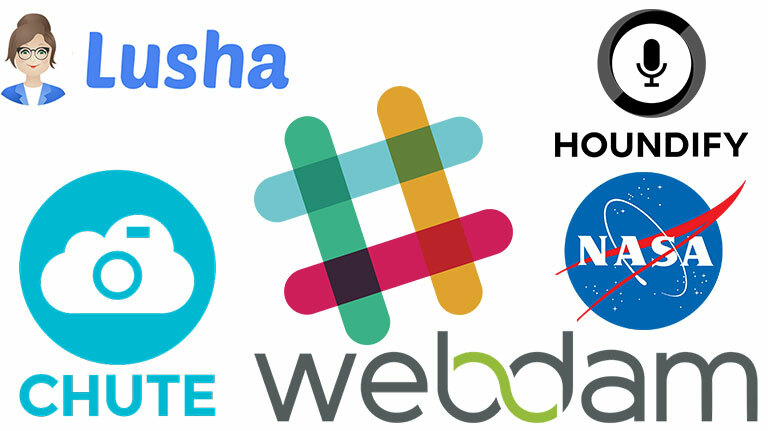 Slack is a cloud-based team communication service, used to bring together messages, files, and posts from Twitter, Dropbox, Trello, Google Docs, and other services. The Slack API is RESTful and uses JSON response formats. Slack’s API provides even greater functionality by allowing wider integration with many other third party applications, above and beyond what you get “out of the box”. Build an intelligent bot that uses the natural language processing capabilities of Slack, for example, a bot that schedules meetings. Build apps that provide real-time updates on customer behavior, such as upgrades, cancellations, and new signups. Build a bot that sends you an email “daily digest” of all the links shared across your team throughout a given day. Houndify provides smart, voice-enabled, conversational interfaces to anything with an internet connection. In this sense, Houndify’s intrigue lies in the fact that it acts as a hub for all the technologies required to voice-enable any IoT device. Houndify is a RESTful voice API. Developers can build speech-to-text applications with Houndify. Houndify can integrate with other services to build custom apps, such as weather apps that read out the weather to users. Sharp and Houndify teamed up to integrate Sharp’s robotic platform with Houndify’s conversational interfaces to build smarter robots. Lusha is a platform which locates business and individual profile information, such as emails and phone numbers, and it is used for recruitment, marketing, and sales purposes. Lusha has its own API of the contacts API type. Broadly speaking, a contacts API provides access to contact details. The Lusha Contacts API uses a RESTful architecture. Get complete profile information on individuals for marketing or recruitment purposes. Given full name and email, the Lusha API completes the picture with phone numbers and location details. Integrate Lusha with marketing tools and sales tools. Astronomy is one of those rare areas that most people can agree is fascinating. Nearly everyone is familiar with NASA, the world’s most famous space exploration and aeronautics body. But perhaps you didn’t know that NASA has its own APIs. These fascinating APIs make NASA’s incredible data, including its spectacular imagery, available to developers. You can use the NASA API to display NASA’s photo of the day on your website or application and impress people. The NASA API collection contains an API full of photos of Mars, going back as far as 15 years, which you can display on your site. Create fascinating apps based on NASA’s enormous stores of data — the agency collects terabytes of data every single day! Regardless of your personal interests, there are enough fascinating APIs for you in the above list to experiment with during 2018. Whether you opt for a contacts API to streamline your company’s marketing activities or you decide to play around with the NASA API, you are sure to find some exciting uses for these interfaces.